Immediately to your left go down some steps and behind a few boxes you can find a Present. Now go inside. Simple puzzle for your first room, step on the moving platform and grab the key, jump over to the other moving platform and go open the door. The puzzle in this second room is similar to one you completed on the ship at the Academy, you need to connect the blocks together so they form a complete circuit from the battery on the left to the lightbulb on the right. To do that push the top and bottom blocks to the right and then push one of them into the middle position. An empty room with a lock on the far side, wait around for a while and some Pirate Henchmen will drop in to say hello. In the second wave one of them will be carrying a key, defeat him and take the key to open the lock. Time for some sidescrolling, wait to jump on the moving platform and let it carry you across the gap, you'll see a square platform with coins along the edges, this platform rotates and is not a sign you should jump to your death. Bounce on out of here back to the left to get Epic Chest 1/4 on the train's roof. Now bounce over to the other part of the roof and drop into a hole. In the darkened room go towards the screen to find a Wishstone by where the entrance would be. You'll have to attack the enemies in here to get the Bomb Brawl carrying the key to appear. More sidescrolling, this time interrupted by some rude pirates shooting at you. On the second rotating platform wait for it to flip around so that the bounce pad is showing, bounce up to the roof and double back a little to grab the Present up here. Once back down continue normally to the right through the door. Persephone and an Epic Chest 2/4 are in the next room, you'll need to solve a Live Wire Puzzle to open the chest though. To do this one you need to hit the bottom left button, then the bottom right button, and then the top left button to turn off the fans. The puzzle in the next room has two different goals, one to open the door and another to lower a tall platform with a Wishstone on it. To do that second one push the middle block down and to the right then the right block to the left and then down along with the left block. To solve how to get out of here from that point you push the middle block up then the right block to the left. This next sidescrolling section is made a little more difficult thanks to the steam being pumped out across the area, carefully cross two rotating platforms followed by a solid section and then two more rotating platforms. Next up are some moving platforms to make your way to the exit door. The next steamy room has a load of Grinnades to watch out for and then a fight with a larger walrus with a key on his back, avoid his slap attack. Once you get into the next room start attacking all the boxes around the place to find the key, it's hidden inside one of them. Another sidescroller, pretty much the same as usual except that when you reach the moving platforms and notice the coins on the underside you should jump down at the right side and find Epic Chest 3/4. Bounce back up and head right to exit. This dark puzzle again has two goals, the tall platform on the right and the batter at the back, but you can actually do them both at the same time. Push the top and bottom blocks to the right then push the bottom block up and then to the left, then push the block you left on the left down then to the right and then up to connect the circuit and earn yourself a Wishstone as well as the exit opening. Approach Epic Chest 4/4 on the right then fight off the pirate ambush, once again the larger walrus has the key. Once they're defeated you can open the Epic Chest as well as the door. For this puzzle push the right side to the left and then up, then push the left side all the way to the right. Push the upper block down and then push the right block to the left, now you can just push them both upwards. A darkened room with loads of moving platforms awaits, as the lights flicker note where the platforms are so you can judge where to be aiming for. Once across the other side kill the Bomb Brawls and exit. Time for a boss fight against Blubberbeard. Before you can actually fight him though you've gotta fight a few waves of the smaller pirate enemies, eventually he'll jump down and get involved. His attacks consist entirely of slowly walking towards you and then swinging his axe, get behind him to avoid taking damage. The boxes scattered about the area will create loads of Grinnades you should watch out for but nothing really troublesome. Once he's defeated you'll get his key and be able to open the cage to finish the level. Another one of those empty chapters, just go talk to Flynn to start the final level. Tessa's quests that include this level is like playing it on Nightmare despite the difficulty setting to either, Beginner (Easy), Adventurer (Medium), or Expert (Hard). 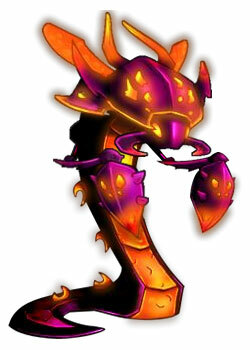 The spiky bombs will kill any Skylanders faster than cannonballs.